Government did not provide food this time but a dozen Caritas volunteers from the local church were there with pots of rice and noodles. Martin took us out in his truck to buy pollo asado, cartons of milk, and crates of fruit, mostly apples. Apples don’t grow in Honduras but the Hondurans we have met love them. They call them “manzanitas” in a way that sounds like a term of endearment. 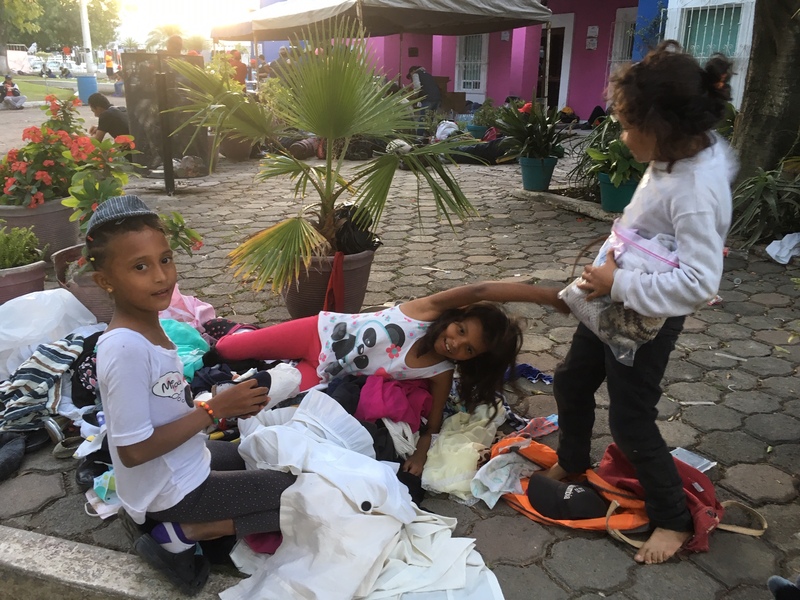 By the time we returned to the site, San Miguel friends had arrived with two trucks full of donated clothes and packaged foods. My taxi driver and young friend, Hector, joined the volunteers chopping roasted chicken and scooping mounds of rice on to plastic plates. When the chicken was gone, he took me to Walmart and we bought every pair of trainers in sizes 38 and 39. There weren’t that many. A few feet away, a group of girls played in a small pile of donated clothes, giggling and tumbling over each other as they pretended to fight over a leather bag, a scarf, a pair of socks. The Salvadorans are coming next I think.